During my late night Safeway run last night I kept running into empty shelves, so I took advantage of the moneymaker deal on salad dressings. 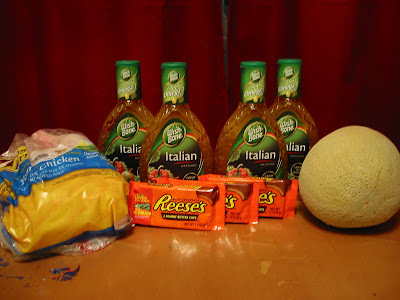 I used the $1.25 overage to go towards a whole FF chicken at $.79lb, and a $.98 cantaloupe. FYI, on several of the Wishbone dressings there were $3 off any meat purchase when you buy two Wishbone products coupons at my Safeway – I used 4 of these coupons to pay for 1 whole chicken, some discounted pork ribs, and 2 packages of Hebrew National Hot dogs with no problems this morning. Before Tues. I plan on going back for more hot dogs to stock up! They are in the Safeway ad that comes in Food Day of The Oregonian , usually. You can also find them at the store. They have a display at one of the entrances that usually has tons of ads. the doubles are on the second page, typically. I'm new to this and I was wondering where you get the Safeway doubles. Are they in the newspaper?